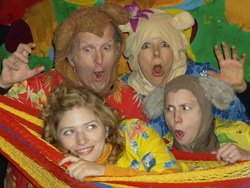 Our Professional Acting Company Members help your audience create a hilarious play. It's an audience participation, storytelling, comedy event for the family. Geared to Pre K and up. Who’s that trip trapping on my bridge? Set in a lovely green meadow sometime in the 1950’s, actors tell the story of three clever Billy Goats with the help of the audience in this whimsical musical adaptation. 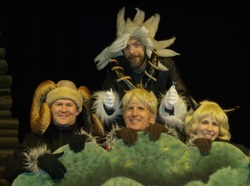 Actors help the audience create a hilarious version of "Goldilocks and the Three Bears."